How does Leaps and Bounds Work? 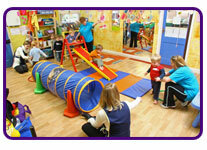 Fun, exciting and flexible yearly lesson plans designed to fit in with the timetable of any pre-school setting. Trained instructors deliver colour coded activity blocks. Each block has a specific learning objective that is reinforced and revised. Each activity has specific teaching points and progressions to help the child develop at their own pace. Involvement with parents. At the beginning of each block children are given objectives and suggested activities to enjoy at home. At the end of each 30 minute session each child will receive an achievement sticker (e.g. I can jump). Thus reinforcing the objectives achieved during that particular week. At the end of every block, each child will receive a certificate outlining what they have achieved. On completion of all of the blocks for that year each child will receive a medal.